Shares of Sears Holdings spiked last week on news that the beleaguered retailer had expanded its tire partnership with Amazon. Once again, the optimism — or is it outright gullibility? — of some investors astonishes me. Over four years ago, I wrote (admittedly more than a little bit provocatively) that Sears investors would do far better with a liquidation of the company than with a perpetuation of the charade that there was any hope for a real turnaround. More recently, I opined on the 2017 Amazon-Kenmore deal, as well as the initial Amazon-Sears tire partnership announced in May. My view was that these deals do little, if anything, to stave off the inevitable for Sears. Moreover, I believe they are ultimately of greater value to Amazon. For what it’s worth, when I wrote (and appeared on CNBC) with my “liquidate ASAP” thesis, Sears’ stock was in the low $40s. When I posted the Kenmore piece, Sears’ shares were down to about $9. My first tire article was written about three months ago when the shares had a bit of an inexplicable run-up, hitting nearly $4. On the day of the announcement SHLD was up 12%, closing at $1.24. Draw your own conclusions, but certainly don’t say that I didn’t warn you. While on one level I appreciate the audacity of hope displayed by certain eager investors, I believe those who display ebullience in the face of these sort of deals are missing three essential things. Dead brand walking. The overwhelming issue is that there is no plausible scenario in which Sears remains a viable national retailer. In fact, with Sears having closed hundreds of stores, with many more to follow after the holidays (if not sooner), one could argue it is no longer a real force on the national stage today. The only thing that keeps Sears afloat is Eddie Lampert and ESL’s willingness to fund a seemingly never-ending stream of massive operating losses. The idea that Sears can shrink to prosperity is ridiculous. For all intents and purposes, they are winding down the business. The particular relevance to the Amazon-Sears tire deal is that the points of distribution will continue to contract, perhaps dramatically. Hardly moves the dial. It’s hard to see material profit contribution from this deal. First, tire installation is tiny in the scheme of Sears’ overall business. This particular offering is solely focused on customers who are willing to buy their tires online and have them shipped to a nearby Sears store so that, a couple of days later, they can have them installed. So to be meaningfully relevant to customers, first the customer has to be willing to wait. Given that a lot of the tire-replacement market is driven by an emergency (i.e., a flat tire) a big chunk of the available market is not addressable. Second, even if waiting isn’t a big deal, there are still likely to be many local competing outlets, many of which are going to be more conveniently located (particularly as Sears continues to shutter locations) and have the tire in stock, ready to install right away. Third, Sears actually stocks a lot of tires, so if you are willing to have your tires installed at Sears, it makes more sense for most people to take a step out of the process and just see if Sears has the tire in stock. In many cases it will. This is a long way of saying that the market opportunity seems quite small. When you further factor in the lower margin given Amazon’s cut, it’s hard to come up with a scenario where this moves the dial in any profound way. Amazon’s Trojan Horse. Sears is desperate. Amazon is patient, smart and willing to try lots of stuff. Sears has few arrows left in its quiver. Amazon can use this partnership to explore the convergence between digital and physical in a large category, acquire some new customers and continue to probe potential private brand opportunities with DieHard and other Sears brands. Sears need to show Wall Street it still has some life in it. Amazon needs to learn how to get deeper into under-penetrated categories (auto and installed services) to help sustain a robust growth story. For Sears, every little bit seems to count. For Amazon, this is a rounding error even if it turns out to be a disaster. So who’s likely to be getting the better deal? To be sure, as is true with the potential sale of Kenmore, Sears has very few decent options left. So there is nothing inherently wrong at this point in the company’s decidedly ragged history to executing this particular transaction. But the idea that this materially improves the value of the Sears brand seems just plain silly to me. See you on the other side of $1. Last week the Wall St. Journal featured a story on Tiffany & Co’s “midlife crisis.” The piece highlighted the jewelry brand’s struggle to regain its “cool” and improve recently tepid sales and profits. A few days later they announced the hiring of a new CEO. Yet Tiffany is hardly alone in dealing with what I have coined the “customer trapeze“, particularly as Millennials become an increasingly important demographic. The customer trapeze is the idea of hoping to reach a new, highly desirable set of customers while letting go of those with less favorable characteristics. Most often we see it at play when brands face an aging customer base. Knowing full well that their customers will literally die off, companies will seek to update their image and strategy to seem more hip and trendy. This might include becoming more fashion forward, less expensive or attaching themselves to celebrities that appeal to different cohorts. The key to executing the trapeze move is to not let go of one group before being fully ready to take on the new one. In Tiffany’s case, over the years they have introduced less expensive items and expanded their assortments in an attempt to widen their appeal. Most recently, they’ve taken on Lady Gaga and Elle Fanning as spokespeople and launched a new, more youthful ad campaign. They’ve even taken steps to lessen the predominance of their iconic blue in their brand imagery. The challenge, of course, is that many of these steps to attract new customers run the risk of alienating long-term, often highly valuable, ones. Tiffany follows in the footsteps of many brands that see the demographic writing on the wall and take bold steps to attract new customers. Readers of a certain age may remember the “This Is Not Your Father’s Oldsmobile”campaign. This is a text book example of a brand that let go of one customer group before it could safely latch onto another one. The once legendary company went too far, too fast and, at the risk of pushing the trapeze analogy too far, suffered mightily from its aggressiveness and decision to work without a net. There are many examples of brands essentially abandoning one customer group too quickly to chase a new, sexier one. Often this comes through an attempt to “trade up” the customer base by pushing more expensive and fashion forward products to attract more affluent consumers. The most recent disaster of this sort came under Ron Johnson’s failed reboot of JC Penney. While not (yet?) fatal, the company has been struggling to recover for over 4 years. History reveals that very few established brands are able to successfully execute a dramatic re-configuration of their customer base–at least quickly. Once you get beyond Cadillac and IBM, the list grows short indeed. It’s not hard to understand why. The more a brand is known for one set of things, the harder it is to persuade consumers to believe something fundamentally new and different. To the extent a company starts to dramatically move away from what made it successful with its traditional segment in the hopes of cultivating a new group, it risks alienating its historical core. More often than not, the customers that are being de-emphasized are significant contributors to current cash flow. We saw this with JC Penney and I witnessed it first hand when we tried similar moves at Sears more than a decade ago. With rare exception, brands simply cannot survive, much less thrive over the long-term without being really good at acquiring profitable new customers to replenish those that leave or naturally decrease their spending. But executing this transition is not so easy. Like any trapeze act, the customer trapeze is all about speed, coordination and timing. Let go at the wrong time, be it too late or too early, and the fall can be disastrous. Is off-price the next retail sector to go off the rails? Amidst all the pain that most of the retail industry has endured during the past few years, the “off-price” sector has been one of the few shining stars. While most retailers struggle to eke out any top-line growth, the segment’s big four–TJX, Ross, Burlington and Nordstrom Rack–have delivered solid growth. While many retailers are closing stores in droves, the off-price leaders have been opening new outlets at a brisk pace while announcing plans to open hundreds of stores over the next several years. TJX, the parent company of T.J. Maxx, Marshalls, HomeGoods and Sierra Trading Post, added nearly 200 stores this past year alone. So while it’s easy to blame Amazon for department stores’ troubles, there is ample evidence that it’s been the major share grab on the part of the off-price and outlet sector that’s inflicted a great deal of the pain. Of course, the bifurcation of retail has been going on for some time. Consumers have been steadily shifting their spending toward more price-oriented brands since the recession. In some cases it has been driven by an economic need to spend less. In other cases by a realization that strong value can be obtained at a lower price, whether that is from a traditional retailer (e.g. Walmart), a leading fast fashion brand (e.g. H&M and Zara), a newer business model (e.g. Gilt and Farfetch) or, of course, Amazon. Yet there is growing evidence that the segment is beginning to mature and that future results may be quite different from the boom of recent years. In the most recent quarter, TJX saw same-store sales growth slow to 1%. Archrival Ross posted better results but struck a decidedly cautious note. Nordstrom Rack, which has been the star within Nordstrom, has seen its growth slow to below the industry average. So while one or two quarters do not indicate cause for alarm, there are several reasons why investors might want to beware. Average unit prices for apparel continue to contract, the discounting environment shows no sign of abating and consumers continue to shift their spending away from products to experiences. This means most sales growth must come from stealing share. That’s not likely to come easily. Competition is always intense in retail, but with the number of new stores that are opening, the rapid growth of online competition and Amazon’s growing and intense focus on apparel and home products (including an almost certain big push into private fashion brands in the next couple of years), sales and margin pressures are certain to become more pronounced. Here comes e-commerce–and its challenges. The off-price industry was slow to get into digital commerce. Some of this was for good reason: it’s almost impossible to make money online in apparel with low transaction values and high rates of returns. But given consumer demand, the convergence of channels and pressure from growing competition, none of these brands have a choice but to invest heavily. But as e-commerce becomes an important growth driver, much of that growth will come through diversion of sales from a brand’s own physical stores–and often at a lower profit margin (what I call “the omnichannel migration dilemma”). As e-commerce becomes a more important piece of the overall business, the economics of physical stores will become more challenging, calling into question the reasonableness of the current store opening pace. The key driver of the off-price business has been offering major brand names at deeply discounted prices. While this is a bit of a con, the consumer is either blissfully ignorant or doesn’t care–at least so far. But as more brands grow through heavily discounted channels the risk of brand dilution goes up. And we’ve already seen several major brands pull back from factory outlet channels and tighten their distribution to wholesale channels where discounting was rampant. As Nordstrom, Neiman Marcus, Saks, Macy’s and Bloomingdales emphasize off-price growth (both physical store openings and online) the brand dilution concern to their “parent brands” looms large. Overshooting the runway on store growth. The over-expansion of most major retail chains is plaguing much of the retail industry right now. So far the off-price sector has escaped this fate, largely because the sector has been gaining share. But if growth continues to moderate and a greater share of the business moves to e-commerce, today’s store opening plans seem awfully aspirational. This is not a 2017 issue, and probably not one for 2018 either. But if I were a betting person, I’d wager that in 2019 we will view today’s plans as incredibly optimistic. While the off-price sector is unlikely to experience the shockwaves of disruption pummeling its retail brethren anytime soon, we should remember that no business is immune from fundamental forces. And no business maintains above average growth forever. Investors would be wise to take a more cautious approach. 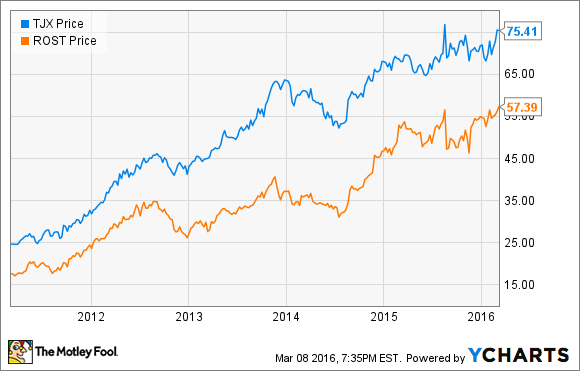 JC Penney: The good, the bad and the ugly. J.C. Penney recently announced its fourth quarter earnings as well as plans to shutter as many as 140 stores. To say the least, the announcement was a decidedly mixed bag. On the good–or at least improving–side, earnings were a bit better than anticipated. Moreover, Penney’s comparable stores sales fell “only” 0.7%, materially better than their direct competitors, indicating some growth in relative market share. The company also continues to experience double-digit e-commerce growth with some 75% of online orders “touching” a physical store. While the picture is incomplete, this at least suggests that they are gaining much needed traction on their omnichannel initiatives. The retailer will continue to roll-out appliances, positioning them well for growth as Sears implodes and HHGregg appears headed for bankruptcy. And Penney’s should gain share in other key categories as Sears, Macy’s and others close stores and continue to struggle. Given the huge revenue drop during the Ron Johnson era, the bad news continues to be that despite all the merchandising and operating improvements during the past three years, regaining material market share is proving nearly impossible. Moreover, the small amount of share that has been clawed back has come at high rates of couponing and promotional activity. Penney’s can never become a profitable retailer merely by closing a bunch of stores and maintaining an unprofitable level of discounting. Until Penney’s proves it can drive positive same store sales and a sustainable margin rate the turnaround remains teetering on the brink of life support. The ugly centers on the increasingly dire picture these announcements paint for “traditional” department stores. Everything we have seen of late from the moderate department store players indicates that the sector’s decades long decline is not only accelerating but is reaching the tipping point where consolidation, store rationalization and fundamental business model restructuring must occur at a much faster and more dramatic pace. There is no scenario in which the available market these retailers compete for does not continue to shrink, thereby eviscerating the underlying economics of hundreds of physical locations. Pruning costs, rolling-out new merchandising strategies, offering “buy-on-line, pick-up-in-store”–and all the other turn-out plans outlined in the press releases–are all likely worthwhile. But they are not remotely close to sufficient. With all the store closings already in the works–and more certain to follow–it will take some time for the dust to settle. The potential for a major acquisition or two may further cloud the picture this year. The only thing we know for sure is that the “profit pool” for the sector continues to contract and it’s very likely that one or more players won’t be around by this time next year. Until one or more of the remaining brands can demonstrate both improving margins and sustained comparable stores sales the sector starts to look one where no one can earn a decent return. And maybe no one gets out of here alive.